In June 1991 we brought the world/s first 33 MHz 386 DX Super-Notebook computer. The tradition continues with the introduction of the state-of-art 486 DX 33 MHz Super-Notebook. 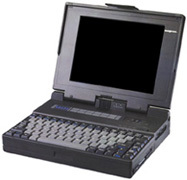 The new EUROCOM 3500 is a lightweight (6 lbs), compact size 33 MHz 486 DX based Super-notebook computer which can run on battery or AC power and be operated nearly anywhere. The system can be used as a high end PC, engineering workstation and/or portable network server. The EUROCOM 3500 Super-notebook fully supports UNIX, MS DOS and OS/2 operating systems. As a portable network server the EUROCOM 3500 fully supports most network operating systems including BANYAN VINES and NOVEL NETWARE. The EUROCOM 3500 Super-notebook features 33 MHz 486 DX Intel or AMD Processors; 2220 m-byte hard drive with an access speed of 17 ms; internal 1.44 m-byte, 3.5-inch floppy disk drive; 8 m-bytes of RAM and 8 k-bytes of internal CPU cache memory. The internal 8 m-bytes RAM fully supports LIM 4.0 EMS and can be expanded onboard up to 16 m-bytes using industry standard memory modules. The system comes with an 82/84-key AT-compatible keyboard with an integrated numeric keypad functions and multi-function keys. The unit includes a high-contrast VGA compatible film compensated triple supertwist backlit LCD Display. The 9 inch display offers 32 levels of grey scale with 640x480 resolution. A maximum of 80 characters by 25 lines can be displayed, and the screen can be tilted to any angle from 0 to 140 degrees. Standard interfaces include two RS-232 ports, a printer port, an external VGA monitor port, an external 101/102-key keyboard port, an external numeric key-pad port and an expansion docking station port. One of the most remarkable features of EUROCOM 3500 Super-Notebook is its ability to support virtually any high resolution video adapter via external (optional) docking station. Once a high resolution video card is installed inside EUROCOM’s docking station the standard internal video is automatically disabled. The docking station adds two internal 16 bit I/O slots to the EUROCOM Super-Notebook compter giving it the same high performance and expandability of dull desktop systems. The docking station has two serial ports one parallel port and one external 101/102-key keyboard port. With its ability to utilize Super-VGA video display cards in the docking station the EUROCOM 3500 Super-Notebook can be used for high quality graphic display presentations or used as a CAD/CAM/CAE workstation. The EUROCOM 3500 Super-Notebook comes standard with a removable and detachable battery pack that can be connected to the back of the system unit with two rollers. The battery pack provides power for up to 2.5 hours of operation under normal usage. The AC-to-DC adapter supplied with the system provides power to the system and simultaneously recharges battery. Recharge time is approximately two hours. The EURPCOM 3500 Super-Notebook is 11” W x 8.5” D x 2” H and weighs less than 6 pounds without battery pack, or less than 7.5 pounds with batter pack. A version of EUROCOM 3500 Super-Notebook with a 220 m-bytes hard drive and 8 m-bytes of RAM is listed at $4500 and is currently shipping. No other portable in the world packs so much performance into such a small package, for such a small price.